Ascending Butterfly: The #Smurfs2 @CitiPrivatePass #FamilyFun 'Blue Carpet' NY Screening held @LighthouseIntl #celebs #photobooth & more! 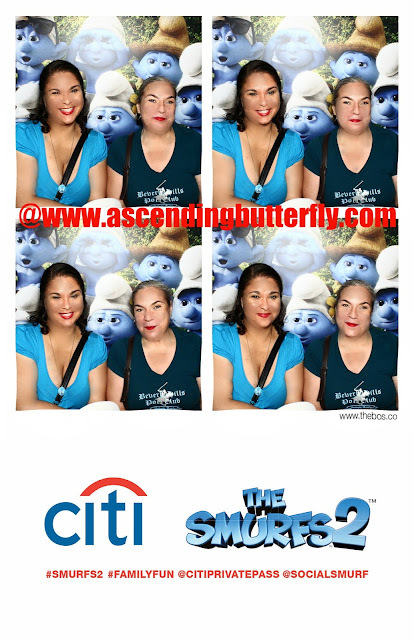 The #Smurfs2 @CitiPrivatePass #FamilyFun 'Blue Carpet' NY Screening held @LighthouseIntl #celebs #photobooth & more! Since I wasn't able to join their super fun screening in Chicago (as I didn't hit BlogHer 13 this year), our pals at The Moms were kind enough to refer us to over a Special 'Blue Carpet' Screening of The Smurfs 2 right here in New York City! The screening was held at Lighthouse International, an organization that is helping to fight vision loss through prevention, treatment and empowerment. You know Smurfs couldn't walk down a red carpet, so they used a Blue Carpet instead! Smurfs and Celeb guests Christina Ricci, Hank Azaria, and Anthony Edwards enjoyed meeting the press, bloggers and special CitiPass Members who were given special seating at the screening. My apologies, this was supposed to go up yesterday for our Wordless Wednesday, but despite spending my morning at the Global Launch of the new LG G2, my technology wasn't playing as nice back at the ranch and my scheduled post never launched! Smurfs 2 is the sequel to Columbia Pictures/Sony Pictures Animation's hybrid live action/animated family comedy The Smurfs. Evil Wizard Gargamel creates a couple of mischievous Smurf-like creatures called the Naughties that he hopes will help him harness the all-powerful magical 'Smurf-essence'. But he discovers the hard way that only a 'real' Smurf can give him what he wants, and only a secret spell known only by Smurfette can turn the Naughties (Vexy and Hackus) into real Smurfs, so Gargamel kidnaps Smurfette and brings her to Paris leaving it up to Papa Smurf, Clumsy, Grouchy and Vanity to return to our time and reunite with their human friends Patrick and Grace Winslow and rescue her. Oddly, I liked this one more than the predecessor! Smurfs 2 is family friendly fun that brings me back to the nostalgia of childhood and the original television series. For those of you that remember, Jonathan Winters was always the voice of Papa Smurf and team butterfly was definitely saddened to hear of his passing. So Butterflies, have you seen Smurfs 2 yet? FTC Disclosure: This is not a compensated post. No compensation has been received to share our recap coverage of this event. Nor did we receive any type of swag. All opinions are 100% my own.